A mink stroller that will be enjoyed for years. Enjoy the longer length that works so well with slacks or leggings as well as over your favorite dinner dress! 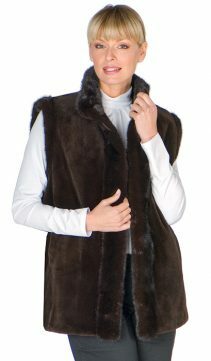 Easy, elegant and all purpose – this female mink jacket is the one fur you need every day and night. The neat shoulders, shawl collar and A line silhouette create a slimming line that will flatter every figure. Available in ranch or mahogany mink in small to plus sizes. If you don’t see your size, call to order. Fur Content: Female Ranch Mink. Fur Origin: Denmark. Length: 35" . Hook and Eye Fur Closures. One button at neckline. Also available in plus sizes. Wanted to say “Thanks” for a great buying experience and delivery of Beautiful product. was somewhat apprehensive but you made the experience easier with your immediate response to all my questions and requests. I certainly liked your responses when I requested updates on delivery. It was let me check status and I’ll get back today, not standard “On Schedule” answer. Highly Recommend your company.